“Russian” Kaveladze at Trump Tower meeting was fervent Hillary supporter: “First of all, I voted for Hillary and my family voted for Hillary.”....Senate Judiciary Committee transcripts of interviews relating to Trump Tower meeting..."All four of the “Russians” in the infamous meeting at Trump Tower...were against the election of Donald Trump." Take Irakly “Ike” Kaveladze. He moved to the US in 1991 and became a US citizen in 2001, still retaining his Russian Federation passport. He is so pro-Hillary that until he learned that the meeting with Don Jr. would not feature information incriminating to Hillary, he didn’t even want to go. Kaveladze: Look, I didn’t want to be a part of a meeting where some negative information on a Presidential candidate would be discussed. So, honestly, I was considering if I realized during the lunch that the meeting would be about negative information on Ms. Clinton, I’m not going to go to that meeting. Kaveladze: Because I don’t want to be a part of a — first of all, I voted for Hillary and my family voted for Hillary, and so I didn’t want a part of this. A registered Democrat, Samochornov works with clients on all sides of American and international politics. In his Senate interview, when asked to list the VIPs he has translated for, Somochornov listed only big Democrats: Hillary Clinton, Barack Obama, John Kerry, Joe Biden. Sounds like another Hillary voter at the Trump Tower table. Next is Rinat Akhmetshin, who came to the USA in 1994. He became an American citizen in 2009, also retaining his Russian Federation passport. As Chuck Ross reported, Akhmetshin has met Hillary Clinton and knows people who worked on her campaign. More than that, he is very closely connected to the Clinton machine through his longtime business partner, mentor, advisor, Washington lawyer Edward Lieberman, whose late wife Evelyn served as deputy chief of staff to President Clinton and also as a top adviser to Hillary Clinton in 2008. (Evelyn Lieberman died in 2015.) As a lawyer, Edward Lieberman has had extensive business dealings in Russia and Democrat ties of his own, having worked, for example, as counsel for The Albright Group, founded in 2003 by former Secretary of State Madeleine Albright. Here’s Akhmetshin’s take on the Trumps. Q. Was it a significant event to you to meet Donald Trump, Jr.? Akhmetshin: No, I was amused, and I’m not a fan of the whole family, so — I was kind of curious and amused mostly. On the day of the meeting, it seems that Akhmetshin and Lieberman rode up together from Washington to New York on the morning Acela. They were going to attend a play that evening, Akhmetshin explained, in which a Russian relative of Akhmetshin’s was appearing. Akhmetshin, however, was just minding his own business, shopping, “holding a shirt, so I had to manage the phone and the shirt,” when Veselnitskaya called him up and invited him to lunch. (Lieberman was off attending to some personal business in blissful ignorance.) At lunch, Veselnitskay invited Akhmetshin along to Trump Tower to the meeting with “Trump’s son.” All very spontaneous. That evening, Lieberman, Akhmetshin, also Veselnitskaya and Somochornov, go to the “beautiful” play, starring Akhmetshin’s relative. How much more film-noirish can this get? Q. You mentioned that you had dinner beforehand with Mr . Lieberman. Did the subject of the meeting ever come up? A. I didn’t mention to him. Which is not answering the question. At another point in the interview. Q. I’m sorry. I’m not sure if I understood you . Did you say that Ed Lieberman was a close confidant of Hillary Clinton? Translation — my head is exploding, what did you just say???? A. His wife was close confidante of Hillary Clinton. Q. And do you know if Ed Lieberman had a relationship with Hillary Clinton or just his wife? A. Oh, he knew her well, I’m sure. Q. And did you know that before June 9th that he was a confidant of Hillary Clinton, or his wife? A. Yeah, I knew all the time. I mean, from the first time I met him (1998). Q. And so knowing that, it never occurred to you to say, “Hey, I just had a meeting where Hillary Clinton’s name came up “? A. Again, I try to be discreet. Not to be cute, but this still isn’t answering whether Akhmetshin and Lieberman discussed the meeting, regardless of how the subject came up. Q. You also said that you met somebody for drinks beforehand. Who was that? A. I don’t even remember now . Q. Was it a friend of yours? A. A friend of mine, yeah . Q. So you have no idea who it was? As for La Veselnitskaya, this seems to be the closest we get to politics in her written statement. Q: Did anyone discuss “hacked” emails belonging to the Democratic National Committee, Hillary Clinton, John Podesta or the Clinton campaign? If so, please explain. A: No, no one did. I was not even aware of this then, since I was at that time not very interested in politics and what was happening with the pre-election campaigns in the United States. I didn’t care who would win. The day after Inauguration Day 2017, Veselnitskaya seemed to care very much. 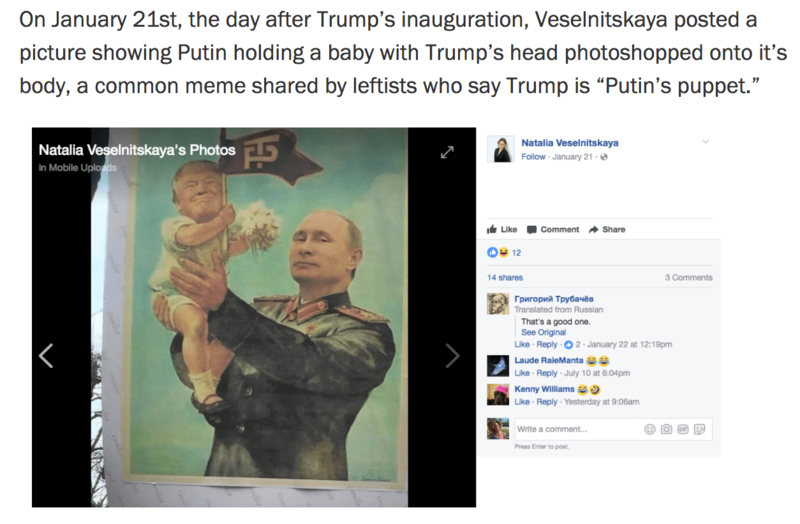 Here is the poisonously anti-Trump “Putin’s puppet” meme that she posted on her Facebook page, since removed. "Three of the four (Veselnitskaya, Akhmetshin, Somochornov), have been involved in a larger, complex enterprise in Putin’s interest, according to the conventional wisdom: to lobby against Russian sanctions (the Magitsky Act). I emphasize Putin’s interest to highlight the apparent contradiction. Yesterday, drawing mainly on interviews with the Senate Judiciary Committee, I set forth the direct statements and strong indicators that all four of the “Russians” in the infamous meeting at Trump Tower set up to assist in the election of Donald Trump were against the election of Donald Trump. Thus a key vector of so-called “Russian collusion” was actually activated by a bunch of Russians for Hillary. I put “Russians” in quotation marks above because three of the four have American and Russian citizenship both. One is even the longtime business partner of an American lawyer, Edward Lieberman, whose close associations with Bill and Hillary Clinton go back at least as far as when his late wife Evelyn was deputy chief of staff for President Bill Clinton. In his Senate interview, Rob Goldstone, the Brit who coordinated the meeting via email with Don Jr., by the way, also revealed something of interest in his along these same political lines. 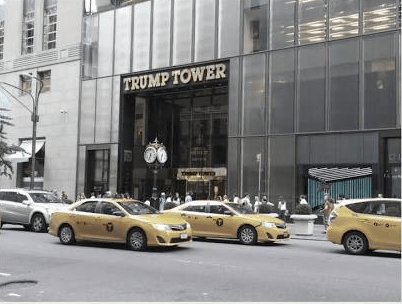 The bizarre series of relationships that led to this 20-minute meeting at Trump Tower on June 9, 2016 center on Goldstone’s capacity as the rep of a Russian pop star, Emin Agalerov, whose “Russian oligarch” father Agar Agalerov had partnered with the Trump organization to stage the 2013 Miss Universe pageant in Moscow. Approaching Don Jr., Goldstone dangled information from the Russian “Crown prosecutor” via Agar Agalerov via Emin Agalerov that was described as incriminating to Hillary. Didn’t they get rid of the “Crown” about 100 years ago? Anyway, in his interview with the Senate, Goldstone makes it clear that his client was no Trump partisan, either — despite this (unfulfilled) proffer of political assistance. Having written to Don Jr. — “This is obviously very high level and sensitive information but is part of Russia and its government’s support for Mr. Trump – helped along by Aras and Emin” — Goldstone drew a line of questioning from Senate staff. In response, Goldstone tried to walk the “government” part back, saying he should have instead said “Russian support,” not “Russia and its government support.” “It’s sort of a bad clause,” he concludes, lamely. Personally, I would like to have seen a follow-up question regarding whether anyone helped Goldstone write the email and suggested such language, but the interviewer was interested in what Goldstone meant by suggesting Agalerov help. Q. And other than arranging the June 9th meeting, what form of help did this take? A. Emin had posted on his social media: My friend Mr. Trump, vote Mr. Trump, he’s done well. He has won in wherever he won. I may also add that we’re very nonpartisan. A few months before that, we had an idea that Emin had a song called, “Woman,” and we put it to images of Hillary, and I had thought it would be a great thing to suggest to the Clinton campaign, because it was a great song that summed it up. And Emin posted that on his social media as well. A few months before … the line of attack was set? Before the “Russian collusion” trap was sprung? What we know is that four “Russians” and their British faciliator walked into the inner sanctum of the Trump organization under false pretenses. None of them were on the MAGA team, American body or Russian soul. On the contrary, there were strong sentiments and even connections among them to Hillary Clinton. But there’s more. Three of the four (Veselnitskaya, Akhmetshin, Somochornov), have been involved in a larger, complex enterprise in Putin’s interest, according to the conventional wisdom: to lobby against Russian sanctions (the Magitsky Act). I emphasize Putin’s interest to highlight the apparent contradiction. And three of the four (that we know of) have links to Kremlin intelligence. Akhmetshin, identified by the House Intelligence Committee as a “former Soviet intelligence officer,” will zig-zag around the question of the nature of his intelligence ties, seemingly depending on whom he is with. The New York Times notes this version of the story: “He told some journalists that he worked with a military counterintelligence unit, but said he never joined Russian intelligence services — unlike his father, sister and godfather.” Clearly, it’s all in the KGB family. Kaveladze, a 52-year-old executive at a Moscow-based property firm with ties to Trump, was found in 2000 to have created hundreds of shell companies for a $1.4bn scheme that US investigators suspected was used to launder Russian money through American banks. According to US officials, Kaveladze’s partner in that operation was Boris Goldstein, a Soviet-born banker whose ties to former KGB officers attracted interest from US investigators after he moved to California in the early 1990s. This may be a silly question, but why do Sovet-born bankers with ties to the KGB get to move to California anytime? “We have obtained information that indicates that this individual [Goldstein] has had a close relationship with companies associated with members of the former Soviet Union’s intelligence agency,” the US Government Accountability Office (GAO) said of Goldstein in a little-noticed footnote to a report in 2000. What do you know, this news broke on April 27, 2018 — the very day that the final report by the House Intelligence Committee on Russia and the 2016 election became public. Mueller's bona fides are an embarrassment to all Americans except those in the Beltway. Samochornov’s résumé had been posted on his own business website. But the site was taken down after HuffPost contacted him with questions about his work with Veselnitskaya…. One of the previously unidentified attendees was Anatoli Samochornov, a Russian-born American translator who previously spent years working for the U.S. government. Samochornov would not confirm that he was in the room, citing nondisclosure agreements. But The New York Times’ Ken Vogel said Friday on MSNBC that Samochornov was at the June 9 meeting in Trump Tower. The interpreter’s mother-in-law also confirmed his attendance at the meeting to The Daily Beast. (continuing): “Samochornov has worked on “high level [United Nations] and private sector meetings for the Secretary of State and other VIPs,” according to his LinkedIn page. He did not respond to a request for comment on whether he holds a security clearance. works with clients on all sides of American and international politics. But his own views appear to be progressive. On Facebook, he has shared clips from MSNBC host Rachel Maddow’s show, labeled former Republican presidential nominee Mitt Romney and Bush-era adviser Karl Rove as losers, and posted in favor of expanded health care coverage and more restricted access to guns. When PEN, the literary and human rights organization, invited a gaggle of Russian writers critical of Russian President Vladimir Putin to New York, he became “great friends” with them, Gessen said….